Marco Benefial, who was born in Rome and who trained there, gained a reputation as a rebel because of his dismissal of the Rococo style that dominated art in Rome in the early 18th century. When one of his paintings was rejected for exhibition at the Pantheon in 1703, he displayed it in a pharmacist's window. He was knighted in 1720 for his work in San Giovanni Laterano. However, he did not succeed in being elected to the Accademia di San Luca until 1641, by which time he was 57 years old. Benefial made himself unpopular with other members of the academy and was expelled in 1755. He effectively retired, enjoying the protection of Nicolò Soderini. By the time of his death, he had been largely forgotten. 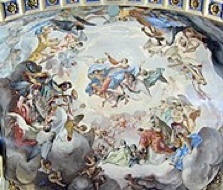 The canon Giovanni Battista Manucci commissioned these frescoes for the presbytery of the Duomo in 1743, after a process that had also considered Sebastiano Conca and Francesco Mancini. He faced competition from Ludovico Mazzzanti, but the decision went in his favour at a meeting of the canons in 1745 after Cardinal Domenico Orsini and other members of the papal court had exerted pressure in his favour. He arrived in the city in the following year and completed the work in March 1749: the inscription along the cornice records that the canons completed the work in that year in honour of God and SS Floridus and Amantius. 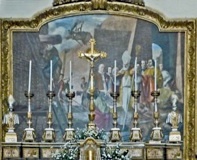 •to the right, St Veronica Giuliani has been inserted in tempera between St Margherita and SS Amantius and Donninus. This was presumably after her canonisation in 1839. •Judith with the head of Holofernes (on the left wall). •St Floridus exorcising a man possessed of a devil at Pantalla (near Todi), which is his first recorded miracle.